Nuclear power has been hitting headlines both around Britain and the world for decades now, and coverage has been increasing in more recent years. There is strong opposition to the construction of nuclear power plants, however the movement also has its supporters, and the UK Government’s approval of new nuclear sites confirms that it definitely is a part of the country’s future energy plans. With nuclear power being such a divisive topic, it can be difficult to find neutral sources on its pros and cons. 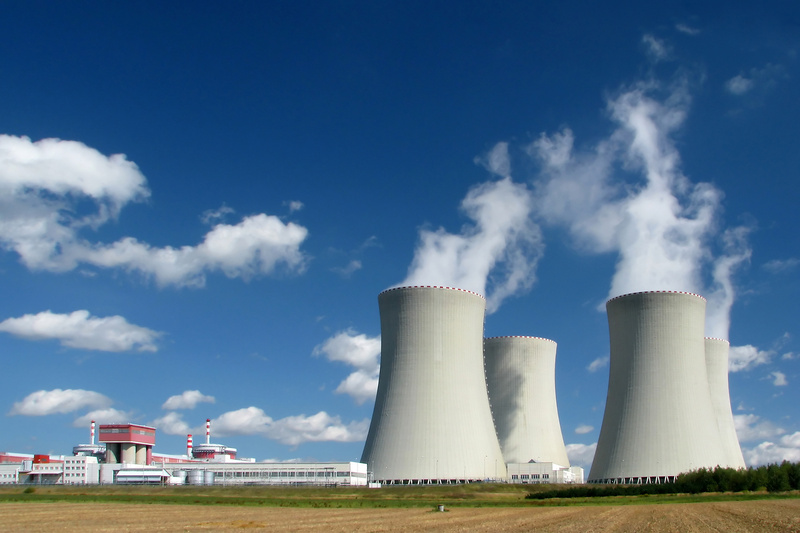 In this series of nuclear power articles, we’re going to give our unbiased account of why nuclear power is so popular in some circles, as well as delving into the factors that make it so controversial. January was a turbulent month in the world of nuclear energy, with Hitachi scrapping their proposed £16 billion Wylfa nuclear power station in Wales. Hitachi and the UK government could not agree on a guaranteed energy price for the lifetime of the power station – as had been done with EDF for Hinkley – which meant that Hitachi “could not make the numbers work”. The move will cost them over £2 billion and will render 1,300 people jobless. This leaves EDF’s Hinkley Point C as the UK’s only new nuclear project set to go ahead, although it may not be generating power for its promised 6 million homes until 2027, rather than by 2025 as planned. Alongside the Wylfa project being abandoned, Moorside and Oldbury have also been shelved, with only Hinkley Point C in the pipeline, suspending 9GW of proposed nuclear capacity. The UK currently has eight nuclear power stations in operation providing 8,883 MWe, contributing to around 20% of the UK’s total energy mix. This percentage is dropping all the time, however, due to an increase in our reliance on renewable energy sources – which supplied a record 33.4% of electricity last year! Nuclear’s decline is also evident in the fact that seven of the UK’s eight nuclear power planets will be closed by 2030 as they reach the end of their lifetime. When you combine this with the government’s shutting down of all UK coal plants by 2025, it’s easy to see why people are beginning to wonder where we’ll get our power from. A Guardian report notes that “nuclear construction is at its lowest for a decade and global nuclear generation has been flat since 2000”, citing the UK’s nuclear trilemma as instrumental in this. The UK has strict carbon targets to meet by 2030 and, while these looked achievable when factoring in future nuclear plans, it’s obvious that we’ll now need to rely on other sources of energy. Gas plants and windfarms can be built relatively quickly and it’s becoming apparent that this will need to happen soon, especially as UK electricity generation is at a 20-year low. One of the main criticisms of renewable power is that it is often intermittent, due to the nature of wind and the sun, but new carbon capture and storage (CCS) technologies are being developed all the time. This prompts the question of how necessary nuclear will be in the UK’s energy makeup over the coming years, especially as it’s widely thought that offshore wind power “has the scale to fill the nuclear gap”. One thing we will need, however, is improved interconnection with Europe to solve the problem of “providing power when the wind doesn’t blow”, although until Brexit has taken place, nobody will be able to plan for such imports of energy. Proponents for nuclear power are quick to point out that building nuclear power plants produces a similar amount of emissions to constructing wind and solar power stations. But emissions produced from construction processes are not people’s main concern: “The bigger environmental problem is what to do with nuclear waste”. We’ve written previously about the problems nuclear waste causes, and will address it later in this article too, but one of the reasons nuclear power is so popular with the UK government is that – aside from its toxic waste – it produces no carbon emissions. 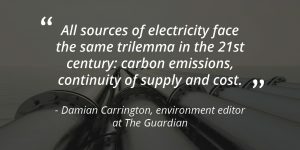 As The Guardian’s Damian Carrington points out, “in the era of climate change, generating power without belching out carbon emissions is vital”. This explains why nuclear power is included so prominently in the UK’s future energy plans, but a lack of CO2 emissions doesn’t automatically make it a popular energy source with the public. The matter of the waste created by nuclear power generation is perhaps the most contentious issue in the big nuclear debate. The government plans to store nuclear waste underground and is trying to locate a site somewhere in the UK with the “right geology” which will allow them to deposit the material and store it safely. However, nuclear power has been produced in the UK for over seventy years now, and there is still no permanent solution. It seems that no communities are willing to take the risk – however small it might be – of a nuclear leak near their homes, no matter how large the cash reward they are offered in exchange. Just as everyone is aware of nuclear waste and its dangers, it’s also no secret that nuclear power is hugely expensive. Hitachi’s abandoned Wylfa project was due to cost £16 billion and overall nuclear costs are continually rising. Solar and onshore wind power prices, however, are steadily dropping and are therefore looking like a much more viable option. Solar and wind power prices are now around a third of the cost of nuclear, and the more common these solutions become, the more affordable the technology is. Hinkley is “billions over budget” and there’s no denying that rising nuclear costs have had a role to play in its delayed development. EDF suggests that keeping nuclear costs down is best achieved by “repeating and copying an existing design” of a nuclear power plant. This promotes cheaper construction and allows nuclear energy prices to “stay competitive with the total costs of alternatives, even as low carbon electricity prices fall”. EDF acknowledge the competition that their nuclear plants have with renewable energy solutions but, at the end of the day, most consumers are just concerned with the final price of their energy bill, regardless of the source. The National Infrastructure Commission noted that new nuclear power plants bring big risks and that “a renewables-based system looks a safer bet at present”, as opposed to relying too heavily on nuclear. They recommended that the government backs renewables to become cheaper, focuses on CCS technologies, and aims to build more wind power stations. At the World Economic Forum’s Annual Meeting last month, Sir David Attenborough discussed the world’s energy supply and noted himself that renewable energy is “where the future lies”. Although nuclear power does have some benefits, it could perhaps be said that the negatives are tipping the scales a little more. Investing money in more traditionally “green” energy solutions would create a safer, more permanent future energy supply for the UK. After all, “the wind is usually blowing somewhere”. Why are so many energy suppliers crashing? 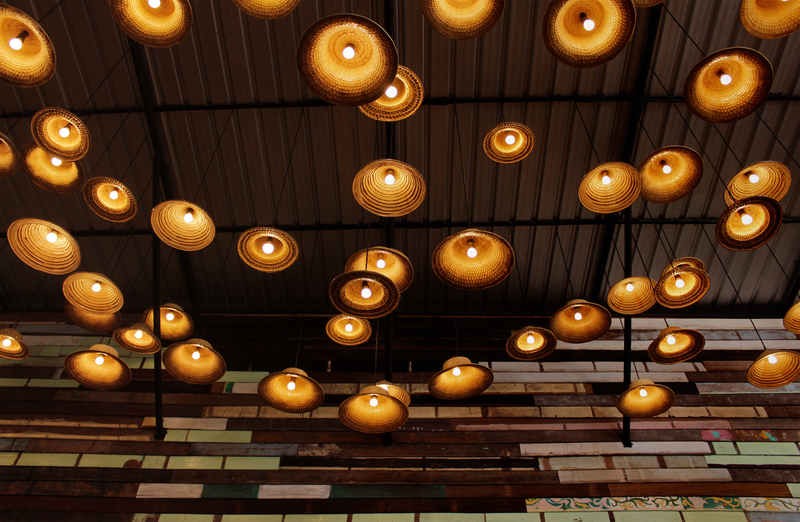 Green by name, green by nature, Kate has a passion for renewable energy and all things sustainable. A dynamic and efficient news reporter, Kate is an arresting force in energy writing. Just as long as a repository of snacks are available to fuel her efforts.